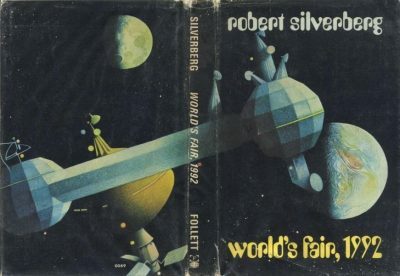 1970’s World’s Fair 1992 is the second in Robert Silverberg’s Regan series. Would-be xenologist Bill Hasting’s essay on the possibility of life on distant Pluto was far-out stuff, but intriguing enough to win the teen a year’s stay on the 1992 World’s Fair Satellite. It’s not a vacation: he will have to work. Still, he’s enjoying a trip that others must pay $$$ to experience. Life on the station is less exotic than one might expect. By 1992 America is an old power in decline. The 1992 World’s Fair was supposed to show the world that America was still great. After all, no previous World’s Fair had been held in space. Investors and impresarios proved hard to convince; the venture might have failed for lack of funding. Then dynamic financier Claude Regan orchestrated an eleventh-hour save. Key to his vision: a display featuring several of the Martian natives recently discovered on the Red Planet. This is where Hastings will be working. It doesn’t take Hastings long to discover that absconding with a handful of the endangered natives is controversial. Scientists in particular view the scheme with alarm, since it would all too easy for humans in inadvertently kill one or more of the Martians. Regan’s solution: conceal from the public any deaths that might occur. The scientific community is not reassured. One scientist participates just to protect the naïve Martians. Hastings enjoys his time in space (ethical qualms notwithstanding). The news that the Fair is not doing well, that financial concerns might dictate its early closure, is unwelcome. Then Financier Regan decides to save his investment by doubling down. He will dispatch a rocket powered by an experimental nuclear engine1 to Pluto, there to poach a few of the native lifeforms recently discovered by robot probes. Hastings’ speculative paper makes him the closest thing to an expert on Plutonian life. He’s recruited for a new journey, to the Sun’s most distant planet! Several characters in the novel assert that Hastings’ speculations about life on Pluto are “theories.” This is diplomatic waffling. “Completely unsupported conjectures” might be closer to the truth. A trope I’d like to kick to death: Hastings asserts in a conversation with a journalist that the sun would be as small and dim as a star from Pluto. But in fact it would be far brighter than a full moon is on Earth. Somewhere, somehow, “the sun is only another star” crept into SF, even though it should be intuitively obvious that for the sun to be as dim as a star, it would have to be as distant as a star: 100,000 AU more, not a piddling 30ish. it’ll get the members of the expedition accustomed to the heavier gravitation on Pluto, where unusually high planetary density produces a grav of something like 1.7 Earthnorm, even though Pluto is smaller than Earth. I am not sure when astronomers settled on a more accurate estimate of Pluto’s mass and density. Silverberg’s Pluto is impossible based on what we know now. Hastings imagined a bounty of helium II, the superfluid state of liquid helium-4 — but Pluto’s too warm for that. The explorers find seas of methane. Pluto should be too cold for methane seas, unless there is an overlooked source of heat (which the explorers no doubt would discovered if this weren’t a quick grab and run mission). This book adopts a number of plot elements with other novels of the time, such as Heinlein’s Have Space Suit, Will Travel and Starman Jones, and Clarke’s Islands in Space. As happens in Have Space Suit, Will Travel, and Islands in Space, the protagonist’s adventures begin with winning a contest (although the protagonist in Have Space Suit, Will Travel won a space suit rather than a trip into space). As happens in Starman Jones, our hero’s affections are won by a rich girl who likes a bit of rough for diversion, not partnership2. Like Islands, the book is a little dull. Nobody making decisions in this book is inclined to take stupid risks, which dials down the incidence of thrilling brushes with death. It was nice, and uncharacteristically empathetic for the time that this book was first published, that Hastings learns to better appreciate the Martian captives. It was a mistake, he told himself, to think that the Martians were pathetic simply because Nature had given them big wobbly heads, sad-looking eyes, and small scrawny bodies. The impression of misery that they gave was not necessarily a reflection of their true inner selves. These were people of an old, tough, durable race who had survived thousands upon thousands of years in a savagely hostile environment. It was wrong to get too sentimental about them when one had little idea of what was really going on in their minds. And this is before he begins to grasp that they have personalities…. The World’s Fair of the book was to be held on the 500th anniversary of Columbus’ calamitous3 voyage to the West Indies. It’s interesting that Western triumphalism rah rah notwithstanding, a fair chunk of the book wrestles with an ethical question: whether it’s moral to treat the natives of Mars as animals rather than persons, animals to be displayed like exhibits in a zoo.. The Plutonian lifeforms are way more alien. They are even more likely to be treated as animals. But even here a few of the humans pause now and then to consider ethics rather than immediately assuming everything they can reach is theirs to do with as they like. World’s Fair 1992 is available here (Amazon) and here (Chapters-Indigo). 1: As in, robot probes equipped with the new drive have been dispatched to Alpha Centauri, which they will reach in about half a decade. Well, at least the builders knew that the drives didn’t malfunction in the comparatively short time that they’ve been in operation. 2: It’s only in retrospect that Hastings realizes that Emily had never promised him more than some harmless kissing … and that she was attempting to get unauthorized access to the Martians. Which she managed on her own once she say Hastings was not going to be of any help. 3: Calamitous for Native Americans/First Nations. Pluto's daylight actually ranges from two hundred to six hundred times brighter than moonlight on Earth, comparable to a badly overcast day on Earth or the lighting in an average home. It generally appears to be much darker because the Sun is perceived as a bright star, there is no atmospheric scattering of light, shadows are completely dark, and most of the surface materials absorb light with minimal reflections. Was "appears much darker" a choice to avoid saying "Weinbaum got it wrong" or losing the, er, atmosphere of the story you were quoting? Or is it actually like that? As James notes, what Pluto "actually is like", or is, has been contentious. It was an attempt to make Weinbaum's description seem a little more like reality - he got it badly wrong, apart from saying that there was no atmosphere. But something like this has got to have a subjective element, the combination of a small-looking sun, dark sky, etc. really should give the impression that light levels are lower. https://en.wikipedia.org/wiki/Extraterrestrialskies#Plutoand_Charon "From Pluto, the Sun is point-like to human eyes, but still very bright, giving roughly 150 to 450 times the light of the full Moon from Earth (the variability being due to the fact that Pluto's orbit is highly elliptical)." If I have this right, the sun's surface is exactly as bright seen from Pluto as from Earth, but at 30 AU it is 900 times smaller and 900 times less powerful. Wikipedia says at least 150 (Earth) full moons so that may be into household lighting territory, but I'm uneasy about calculating that. I'm not even sure what unit to use. Perhaps someone produced whimsical advice for photographers on Pluto that would clarify it, what film and exposure time to use. But I don't speak that language either. Where I am, at 69 degrees north, I get it for an extended period. On January 15th, 2019, it's at 10:37 am. Sunrise will be at 11:30. And there's no problem driving around without lights at that level of light. "an overlooked source of heat" - this high density Pluto presumably contains quantities of radioactive elements (K-40, Th-232, U-238, etc). My intuition that this isn't enough to melt methane, but it might be getting close - with an earthlike albedo I calculated a temperature of 53K, but that was before I remembered the need to remove the effects of the greenhouse effect from the Earth's temperature. Wikipedia says that the real Pluto has a surface temperature of 33-55K (mean 44K); the melting point of methane is ~90K. You'd need 15 times the solar insolation from radioactive decay to melt the methane, though you could substitute a lower albedo for a little of that.